The jolly old man in red is all over Burlington. Santa has arrived at The Burlington Mall and has taken up daily residence in his "cabin" at the mall. We are not sure how he does it but he will also be appearing weekends at The Mapleview Centre and you can receive a free 5x7 photo to capture your holiday memory. The Royal Botanical Gardens will play host to Santa many times throughout December this year. Each weekend between December 3rd-18th from 10am-4pm, you and your little ones can meet the jolly old elf and his reindeer friends! 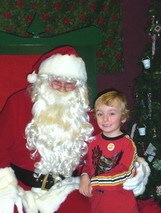 Sundays, enjoy a hot breakfast with Santa starting at 10am until 12pm. There is always excitement in the air for Burlington’s annual Christmas Parade! On Sunday December 4th, Santa and over 65 bands, floats, clowns, and mascots travel from the Burlington Mall at Prospect Street and Guelph Line to Brant Street and Caroline Street downtown. Find a spot along the route and have fun! Non-perishable food items for the local food banks will be collected by the Burlington Teen Tour Band and letters to Santa will be picked up by Canada Post letter carriers. Have you every seen over 3,000 Santas running loose in the streets? This December 10th you can! Bundle up in your own Santa suit and take part in Canada’s largest all-Santa 5km Run! Run or walk through downtown Burlington or cheer on the hundreds of Santas.Visit their website today to register for this fun-filled event! Ho, ho, ho!! View the Santa Run video here. Be sure to head to Ireland House at Oakridge Farm on Friday December 9th for Candlelight Tours of Yesteryear. 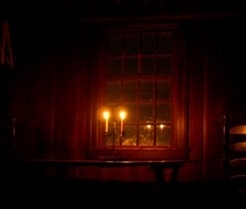 Experience a wondrous guided tour of this historic property illuminated by candlelight. The house will be filled with the sights, sounds, and smells of a traditional Christmas, as performers play holiday songs. Father Christmas will welcome guests as they become a part of a historic farmhouse family, with delicious period-style refreshments to sample and holiday crafts to create and take home. Tickets for a full tour, crafts, and refreshments must be purchased in advance. Burlington is “dressed” for the holidays! The annual “Doorways to the Holidays” will be at the Royal Botanical Gardens until January 8th. Read about our visit to Doorways to the Holidays last year. The RBG will also have seasonal activities, musical entertainment, local school and adult choirs, model train and light displays, and more to keep your December weekends full and festive! The picturesque Paletta Lakefront Mansion will open its doors to the public on Monday, December 19th from 10am-3pm. Explore the wonderfully restored 1930s mansion and beautiful waterfront grounds, while also enjoying the holiday decorations and musical entertainment. There will be free admission for the day. Canned goods donations will be accepted. 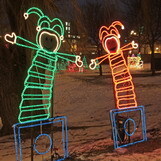 Spencer Smith Park will once again shine brightly with holiday spirit from Sunday December 4th to January 12th. Each evening, the downtown park will dazzle visitors with more than 60 spectacular animated figures and illuminated displays. The 14th Annual Festival of Lights is a free event that has become a fabulous Burlington holiday tradition. So many of Burlington’s amazing attractions will help you to make fun holiday memories with their special activities and entertainment. Take advantage of the Halton Streetcar Museum’s last days before they close their doors until Spring 2012. “Christmas on the Rails” on Saturday December 3rd and 10th allows you and your family to hop on a train and take a ride through the beautiful, snowy woods with Christmas carols in the air. As we head into December join the Burlington Downtown Candlelit Stroll and experience a night of holiday fun. On Friday December 2nd head to City Hall and purchase a candle in support of United Way of Burlington and Greater Hamilton. From there, stroll and enjoy the live music and entertainment at downtown shops and businesses and return to City Hall for hot chocolate and sweet treats. Weekends in December starting December 3rd and running to the 18th you can enjoy Bronte Creek Provincial Park and partake in free take home crafts and heritage activities for the whole family at the Breckon Shelter from 10am - 3pm.